Dirt bikes are quite amazing, and there is a wide variety of them designed for motocross, supercross, trail riding or enduro. These bikes are anywhere between 250 CC and 450 CC and are powerful gas bikes designed for off-road tracks. 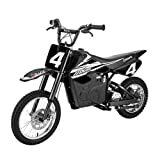 The electric dirt bikes are scaled down versions of the original full powered dirt bikes and are meant to give kids a feel of what riding a bike off road is like. If you are thinking of giving your kid an electric dirt bike, you will be giving them much more than a gift, but a way to learn, enjoy and test out their skills. Much before getting into the benefits of letting your kid try out an electric dirt bike, we need to emphasize that their safety is paramount, and you should make them wear all required safety gear, from helmets to knee and elbow guards, when they ride an electric dirt bike. Continuing on the safety aspect, electric dirt bikes are an excellent way to let your kids experience riding on a dirt track without needing to worry about high speeds, as their maximum speed is around 18 miles per hour. Electric dirt bikes are designed to look like the bikes that are ridden by the superstars of dirt biking, but are actually scaled down and kid’s version in terms of power, speed and capability. 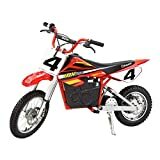 If your kid wants to feel like his or her idols in dirt biking there is no better way to let them experience the dirt track than with a kid’s electric dirt bike. Since they are electric, there is no fuel cost. These bikes need to be charged through a regular home power socket, and usually have a riding time of around 30 to 40 minutes, which is enough for your kid’s full entertainment and thrilling experience. Razor is one of the biggest names in electric dirt bikes, and you will see a lot of their electric dirt bike models featured in the top 10 best bikes list below. There are essentially two major kinds of electric dirt bikes, the ones meant for smaller kids and those meant for slightly bigger kids. The ones meant for smaller kids are made of plastic, have a maximum speed of 2 to 3 miles per hour and may also feature support wheels for added stability. The ones meant for bigger kids in the range of 10 to 15 years, are able to take more weight and have speeds going up to 18 miles per hour. 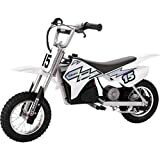 This list of kids electric dirt bikes features bikes meant for bigger kids. Though the load capacity of the bikes and the recommended age is around 14 years or so, but many younger kids will also be able to have a very good time with these bikes. Slightly bigger built kids aged 8 or 9 will also find these bikes easy to ride and incredibly fun. When a kid rides an electric dirt bike, they improve their motor skills and hand-eye co-ordination, and it also encourages cognitive abilities. A kid taking a dirt bike on a dirt track is faced with challenges and has to react to changing situations quickly and effectively. This not only boosts their confidence but also helps them shape their character. Riding an electric bike in a challenging track really improves the skill and overall body balance of kids and also gives them a huge thrill. Of course becoming the center of attraction and being one of the few kids in the neighborhood to have such a cool bike will be a fantastic feeling for your kid too. 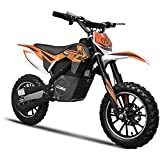 Considering all of this, it is not a bad idea to choose a good electric dirt bike for your kid from the list of the Top 10 below. These top 10 best selling electric dirt bikes are the very latest and are current top sellers. 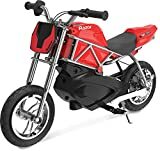 The list gets frequently updated with the electric dirt bikes that are in demand. Pick the one that looks good, and check out their reviews, before buying. You won’t find any bike that is perfect in every way. After all they are not full fledged dirt bikes, but scaled down electric versions, so don’t expect the world from them. Recommended for ages 16 and older (220-pound weight limit); 90-day warranty . Initial charge time: 12 hours.Failure to recharge the battery at least once a month may result in a battery that will no longer accept a charge.